Note From the Author: This review has been rewritten, and I offer my most humble apologies to Pixel Dash. The initial copy received didn’t include the online multiplayer which significantly changed this title and turned into an incredibly enjoyable experience. Another significant change from the initial writing was a hardware issue on my side, a controller stick was not functioning correctly which seemed only to have an effect when braking in the game making a significant function of each race very difficult to overcome and it was something I thought was part of the game to compensate for the turn of the bike in a drift. Both of these were errant on my part, and again I would like to extend my sincerest apologies. Pixel Dash Studios attempts to bring the rubber burning, skull-crushing action back in their post-apocalyptic setting. As indie studios grow in popularity, the trend to remake classic titles has become a bit of a fad. Developers do their best to give us an experience the way it was initially envisioned, attempting to overcome the erstwhile limitations of technology. Most remakes or reboots are unnecessary, since there are so many ideas that the industry has yet to explore, but there are a few from my childhood that I’ve been dying to see spiced up with modern capabilities. Road Redemption, as the “spiritual sequel to Road Rash (1991),” promises to bring back one of my all-time favorites. Pixel Dash Studios attempts to bring the rubber burning, skull-crushing action back in their post-apocalyptic setting. Road Redemption, primarily funded by a Kickstarter campaign, boasted a storyline centered around a character freshly released from prison, now forced to use whatever means at his disposal to fight his way back up the ranks of his motorcycle club. Those means just happen to include, swords, pipes, shovels, and shotguns, of course. The story upon launch, however, is far different, and while it’s faithful to the theme, it doesn’t fit the title as well as the originally planned story. Upon release, the story follows a biker gang, the Jackals, on a mission to collect the fifteen-million-dollar bounty on the head of a man who assassinated the leader of a major cartel. Of course, all the other gangs have the same goal, and they are more than ready to kill for it. As you’re screaming down the road on two wheels, the controls handle well. As you jump into the title, you’ve got the choice of three different bikes, each with slightly different attributes. Your hog will have slightly different acceleration, top speed, and handling (steering) than the other bikes available. These are loosely based on real-life models with names like the “Hardly Davidson.” You’re also given the choice of riders with different stats; one, for example, has less max health but has much higher crit damage. The selection of bikes and riders increases by either completing levels or gaining experience points to unlock them, as well as character enhancements to make the next ride more survivable. As you progress through randomly selected story missions, you’re able to purchase temporary upgrades or pay to refill health and your nitro boost meter, although you can also gain bonuses by driving over power-ups or dropping fools up and down the highways. Some of these suckaz will even have symbols floating above their heads, and you're rewarded with money or health for turning them into road pizza. As you’re screaming down the road on two wheels, the controls handle well. 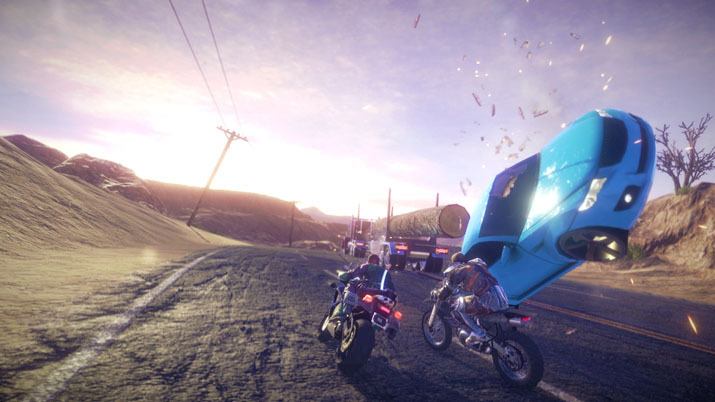 Road Redemption obviously has a more arcade than simulation feel, which you would expect as your focus is split between fighting and driving — and don't worry, there are a plethora of attacks at your disposal. Your arsenal includes pipes, shovels, spiked bats, sticky bombs, and firearms, among other contraptions, to slay your enemies. While the keyboard is an option, this ‘arcade feel’ makes the controller feel more comfortable, though unfortunately, you’re not able to customize the controller key bindings. While riding is responsive overall, if you hit a corner too fast, it’s like hitting a patch of ice, and you take an unnatural slide off the road. Sliding off the pavement would make sense if there was an apparent break of traction or if physics and modeling held up, but the NPCs are on rails, and you're the only person dealing with the massive understeer. Hitting your brakes will throw you into a drift which allows you to manage these turns and, while the NPCs don’t deal with this, the playing field is leveled in multiplayer where skill indeed prevails. Your controls only limit you by forcing you to keep both tires on the ground. The American dream revolves around popping a wheelie down the highway while swinging a spiked baseball bat… or maybe that's just me? The main benefit of remaking games from the past is, of course, updates in both graphics and physics. While the driving physics aren’t up to par with motorcycle simulations, such as the bike racing simulator series Ride (Milestone S.r.l. ), the ragdoll effect of riders in massive crashes, or the wrenched metal of cars slamming into each other all around you, is incredibly amusing, time and time again. The graphics are obviously an improvement over the original Sega Masterdrive/Genesis predecessor and, while it looks pretty solid, it’s not groundbreaking. However, the visuals are crisp and run at 60fps without a lot of lag. The sound design, similar to the visuals, was also a bit lacking. The voiced characters were well done, but I was looking for different motorcycle types having different engine sounds, but instead, you’re giving a very throaty cruiser-style exhaust sound, even if you’re on a sports bike model. One of the most important things in an arcade title (to increase replayability) is the multiplayer experience, and Road Redemption offers the classic feel of split-screen co-op as well as team death races. Any rubber-banding issues and the predictability of the on-rails NPCs is ripped from you in the most satisfying manner possible. Multiplayer offers a large selection of riders and bikes from which to choose, and a variety of weapons that you’ll wield while starting each map are unlocked. The races are a team point-to-point best three-out-of-five series. The matchmaking is incredibly quick, though you may get stuck in at the beginning of a race while the pack is already halfway through. I would rather find myself put in a lobby at the start of a race rather than waiting for the group to finish as it allows you to get a handle on the given track and prepares you to get thrown in at the beginning of the next run. The updated graphics and physics engine are sure to bring enjoyment and laughs. 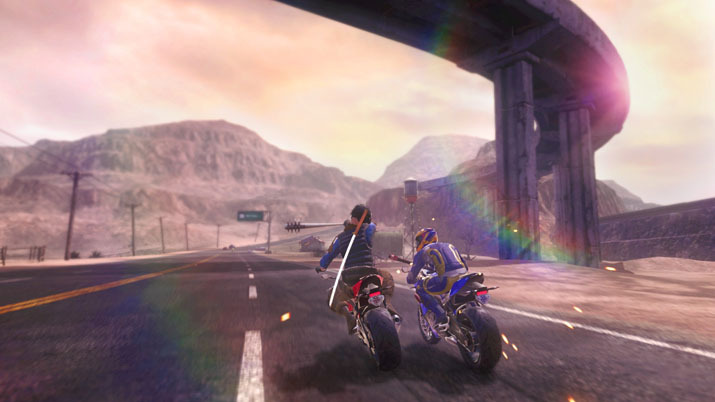 Road Redemption builds on a relatively simple concept that has worked in the past, repackages it and allows the unpredictability of other players a large selection of tracks, bikes, and riders in online death races to round out a uniquely enjoyable experience.